Adobe Connect is a web-based communications tool that allows users to meet, share and collaborate virtually from their desktops. One of the advantages of this system is that there are few technical requirements to use the tool. All you need is a standard web browser and speakers. (A web camera and microphone are optional.) A PC or Mac computer can be used to access the virtual meeting. Note: For the purpose of consistency between the Hunter College written or web documentation and the Adobe Connect Pro software terminology, we will use "meeting" to represent a virtual class session, "host" to mean the faculty member or meeting leader, and "participant" or "attendee" to refer tor students or others attending a virtual meeting. To gain access to this system, you must first have an introductory training in Adobe Connect and then an account will be created for you. 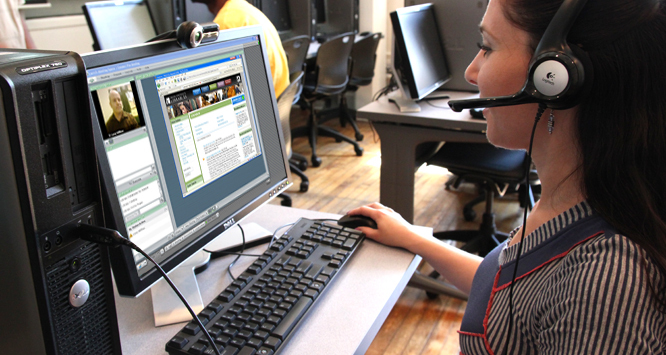 If you are a Hunter College faculty member or administrator interested in using Adobe Connect, please email training@hunter.cuny.edu or contact the Faculty and Staff Helpdesk to schedule a time to learn more about Adobe Conntect. Training workshops for using Adobe Connect Pro will be held periodically throughout the semester in the Technology Resource Center (TRC), located on the 4th Floor of Thomas Hunter Hall on the 68th Street campus. Check the TRC training schedule for dates and times of these workshops. Please contact your Professor for assistance with Adobe Connect.